Whenever the Pirates are home on a football Saturday, Mike Myrick can be found in his seat at Dowdy-Ficklen Stadium, watching his alma mater. But sometimes, as he takes in all the trappings of the stadium and the surrounding campus, he is transported back – in his mind – to gritty evening practices on what is now called Bagwell Field. Back then, when a practice ran late into the evening, all available cars were rounded up and the team would run drills by car light in preparation for Southern Conference clashes on Saturdays. Myrick has a keen sense of history. It was long ago that he and his teammates, on the very same field, engineered a pair of back-to-back Southern Conference titles under the guidance of Sonny Randle. 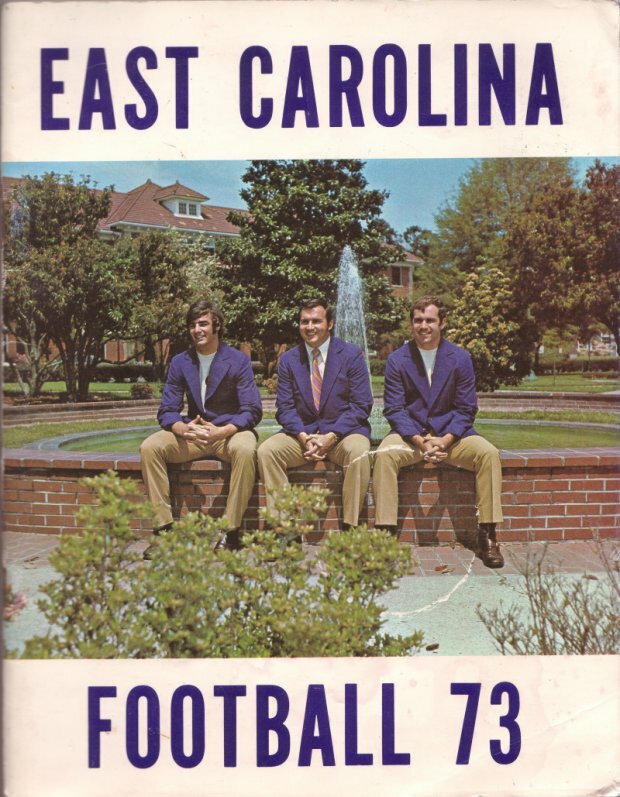 In practical terms, the players of that era ushered in the beginning of the rapid rise of the East Carolina football program – a contribution that makes Myrick proud. Coach Sonny Randle, and DB and defensive captain Mike Myrick. Click the picture for a full view of the cover image. Myrick was a heady defensive back for the Pirates from 1970-73, relying on his physicality as a hitter and his knowledge as a two-way performer, playing wide receiver on the offensive side of the ball. An All-Southern Conference performer as a senior, Myrick epitomized the very fighter mentality that has served the ECU program so well. On the field, Myrick gained respect through a strong desire to succeed and a natural penchant for leadership. Coming out of Goldsboro High School, the wide receiver-linebacker prospect didn’t have many options football-wise. Small schools were interested, but his unique situation at home also had him wanting to stay close-by. McGee’s promise meant more to Myrick than many would know. At home, Myrick was the eldest of six children. At 16, his father died unexpectedly at the age of 39 — and the teen-aged boy quickly became a man. The discipline gained from a forced maturity beyond his years paved the way for success on the Pirate football field. “To be truthful, I just loved to catch the football and to hit and tackle. At first, (my goal) was just to go out and make the team,” he said. “Then making good enough grades to make sure that I stayed in school and make sure I didn’t spend any money, because (mom) didn’t have it. But there was another source for Myrick. From McGee, who gave him his chance at ECU, to freshman coach Henry Trevathan, to Randle, who helped him achieve greatness, Myrick’s coaches all hold a special place in his heart and are, in large part, responsible for the man Myrick became after college. “We had a particularly close freshman team,” he recalled. “And even though we were 0-5, Coach Trevathan really brought us together and made us players. I thought Mike (McGee) was a really good guy and a good coach. Very polished. But, he was passing through, as a lot of coaches have at ECU, but I will always think highly of him. Becoming a defensive back was tough at first. When Randle was hired, he was ecstatic. As the third receiver heading into the Purple-Gold game, Myrick was pumped up about the season. But, as it often goes, the team became thin on defensive backs and Myrick was the only receiver who liked to hit. So, he was switched. Those boys, as he puts it, helped change ECU’s program. After a disappointing 4-6 season in Randle’s first year at the helm, the Pirates took off, posting back-to-back 9-2 championship teams. Though Randle’s offense was a juggernaut, the era is perhaps better known for having given birth to the original “Wild Dog” defense at ECU. “We ran a 4-4-3 defense then, and my senior year I played strong corner,” he said. 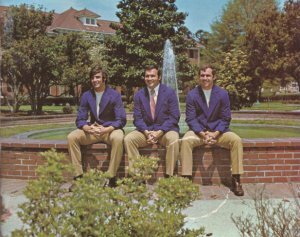 “Our defense was nationally ranked and (Danny) Kepley led a great set of linebackers. I got to play with some real good ballplayers. Not surprisingly, in 1973, Myrick was the captain of that “Wild Dog” defense. It would be a sign of things to come. 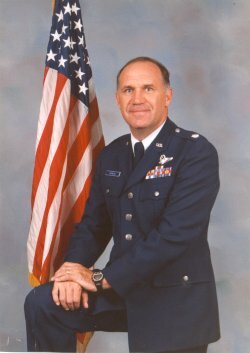 After graduating with a degree in History, Myrick went on a to a long, distinguished career in the United States Air Force, retiring with the rank of Lieutenant Colonel. In his military career, he was able to satisfy a burning passion to travel. And in true leadership form, Myrick took himself to those places, as a navigator on a C-130, logging more than 4000 hours in his 12 years of flying. And, again, in typical fashion, Myrick was the squadron’s den mother. Myrick climbed the ranks quickly, serving in the Chief of Command Post in Guam. Faced with a decision that many command personnel face in their careers, Myrick chose not to follow the path to the general ranks, which tends to frequently go through the Pentagon. Instead, he opted to take a command in the Air Force ROTC. Ironically, he would serve as AFROTC commandant at Texas Tech University, followed by his final post as the commandant at East Carolina — completing a path that took him full circle and allowed him to finish his career helping young men and women at the very location that gave him his start. Retirement came for Myrick after 22 years in the Air Force. He then coached for a two seasons at Pinehurst High School before taking the job he currently holds as the General Manager for the Goldsboro/Wayne County ABC Board. He and his wife Mahala — a school teacher — have raised three children and make their home in Greenville, a place from which he says they “don’t ever want to leave." It seems right that Myrick lives within earshot of his alma mater. From an era that so closely illustrates the challenges that ECU continually faces, Myrick is a living example of the University. “Our team and our university were on such parallel courses then,” he said. “We were fighting to become something and some (people) were fighting to hold us back. But no one would give up. The culture on campus then was incredible. People like Jenkins, who was an unbelievable chancellor, and Booger Scales, and the Minges family, they were all fighters for this university. So it is with a big smile, when Myrick drifts back in his mind to those days, that he remembers a group of young men, all of whom he considers extended family, who were fighting the fight of a university. And when he surveys the Dowdy-Ficklen Stadium field and the campus today, he sees that the fight was well-waged. 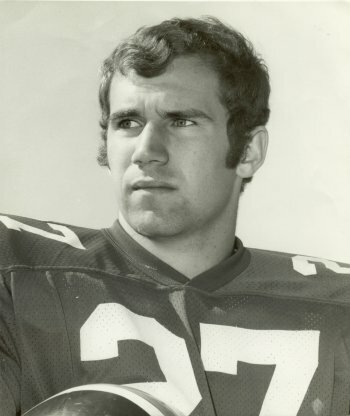 Mike Myrick was a co-captain and one of the star players on East Carolina's 1973 Southern Conference Championship team. This photo appeared in the November 10, 1973 game program for that season's championship game between ECU and Richmond, which the Pirates won 44-14 before a then-record Ficklen Stadium crowd of 21,251.